Free exercise program: workout calendar plus a guide to exercise. Create your custom weekly workout schedule. The free exercise program below is set to match your fitness level whether you are a beginner or an experienced exerciser. Starting as a beginner, in 8 weeks, you can progress to the regular exerciser’s routine, which is enough weekly exercise for much greater health benefits than those of a sedentary person. This workout schedule is a match for people who are new to exercise, age 55+, or just returning to exercise after being inactive for 4 weeks or more. The goals of this stage are to get your muscles, joints, and cardio system used to being physically active, to become a good judge of your exercise effort (see the free exercise tips), and to learn good technique during strengthening exercise. Start with 15 minutes of exercise per day and progress 3-5 minutes per week as appropriate. Cardio exercise good for this level includes activities similar to brisk walking, partner dancing, yard work or vigorous household cleaning. Refer to the metabolic equivalent article and pick activities with an exercise intensity rating between 3-5 'MET'. Maintain a moderate (5/10) effort level as you exercise. For your twice per week strengthening routines, pick from the free home exercise programs. Start with the back strengthening exercises routine, and then continue with either resistance band exercises, body weight exercises or knee strengthening exercises. If you have any joint or muscular problems, you can start out by working on basic strength and mobility instead. See my article on physical therapy exercises and choose the appropriate routines. Another option for strengthening would be to include physical activities that require some type of muscular exertion, such as weeding, waxing your car, or planting shrubs. If you take this approach, watch your posture to protect your back and knees, and include back strengthening exercises at least 1 time per week. For flexibility training, the article on home stretching exercises has a good routine for the major muscle groups. Follow this routine 3 times per week or more. This will help you prevent muscular discomfort, strain and injury and it will also make everyday activities like bending and reaching much easier. Once you can handle 25 minutes of moderate exercise per day without strain or undue fatigue, you can graduate to the next free exercise program below. If you have been off and on with your routine, but have maintained some level of conditioning, start here. To start this program, you need to be able to exercise at a moderate or greater effort level for at least 25 minutes. Goals for this stage of the free exercise program are to increase calorie burn and strength development while maintaining good exercise technique and judging exercise effort correctly. Cardio exercises appropriate for this level are activities like brisk uphill walking or hiking, playing with kids vigorously, or singles tennis. Increase your exercise effort level to vigorous (6/10) for several of the workouts. Refer to the metabolic equivalent page and pick activities at or above 4 MET. Before or after your cardio exercise, train your core with the routine from the back strengthening exercises article, increasing your reps and trying the more challenging version of each exercise as appropriate. A helpful workout to try at this stage is high intensity interval training. For a given activity (walking), pick up your pace to a vigorous-hard effort level 3 times, one minute each time, during a 20 minute workout. As you get used to the workout, you can progress the “pick-ups” to 90 seconds or 2 minutes each. Add 2-3 minutes of exercise time each week until you reach 35 minutes for your workouts. Then you can progress to the next free exercise program and fine-tune your fitness. For upper and lower body strength training, choose 2 workouts from the free home exercise programs: ﻿body weight exercises﻿, resistance band exercises, and / or knee strengthening exercises. You will find 2 stretching articles to be helpful at this stage: The articles on shoulder stretching exercises and back stretching exercises will cover the upper and lower body for you. Note: Once you reach 3 hours of moderate intensity exercise per week and you have workouts and activities that you enjoy & can stick with consistently, you have a prescription to reduce your health risks significantly. At this point, it may not be necessary for you to take more time for exercise, but test it out. If you can tell that more exercise gives you greater mental focus, strength and energy for doing what you're meant to do in your life, then the extra time is worth it. If you are have been exercising moderately to vigorously for 30 minutes or more per day, and you are looking for an extra edge in your physical ability and mental focus, this is the stage for you. Goals are to maximize fat loss as needed, build optimal strength and establish an active lifestyle with proven health benefits. Gradually progress to an average of 45 minutes of exercise 6 days per week, particularly if you need to lose weight. iFor your cardio training in stage 3, include physical activities like jogging, vigorous biking, swimming, boot camp or calisthenic exercise to continue to build your fitness. Pick activities with an MET rating of 5 or more, according to your ability level. When you use a light-moderate effort physical activity for your workout, double the time to 70-90 minutes for greater calorie burn and health benefits. For 2 days per week, include the intermediate workouts from the article on high intensity interval training up to 2 times per week, and try a hard+ exertion (7-8/10) during the interval as you are able. Sports such as basketball or tennis would qualify as HIIT due to the bursts of effort needed during the games. For strength training, continue at 2 times per week and begin using the more challenging moves from the free home exercise programs. Combine 2-3 workouts into one and increase your effort level during strengthening to hard (7/10). For core training, include the stability ball exercises and / or pilates sample exercises. Increase your resistance, repetitions and / or progress to the more advanced version of the exercises as appropriate for you. Parallel to the free workout plans, this free exercise program is a gateway to proven physical fitness and substantially lower risks of serious chronic disease and premature death. Because of the many health benefits, this program is worth your consistent effort. Let me know how your workouts are going in the comments below. Compare proper form with common core training errors and see how you measure up. This book takes you through 2 routines and includes a training schedule so you can keep challenging your muscles with every workout. 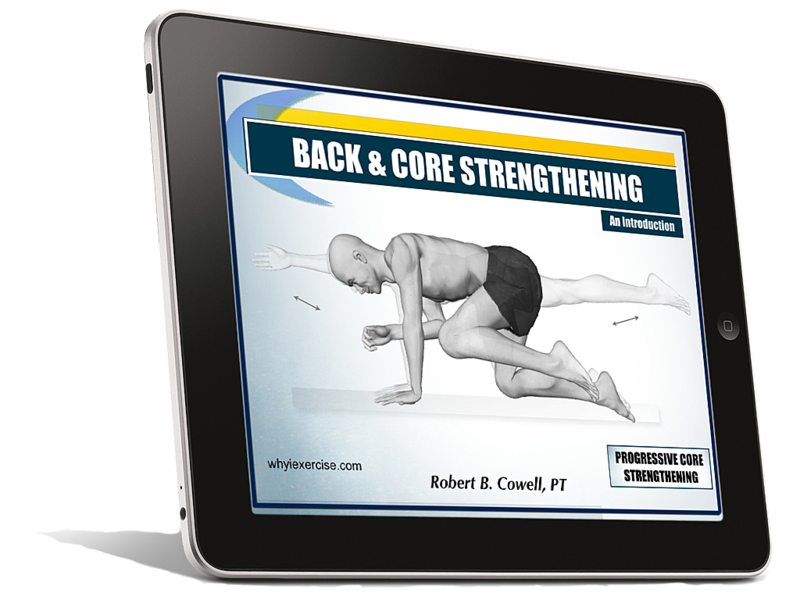 Click here to download this free training resource! Return from free exercise program to free home exercise programs.